James continued their Better Than That tour with a sold-out at the recently refurbished Middlesbrough Town Hall. 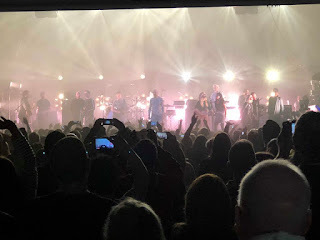 In front of a seated crowd that didn’t remain that way for long, they debuted another new song, resurrected an old favourite and introduced some new selections from their back catalogue. 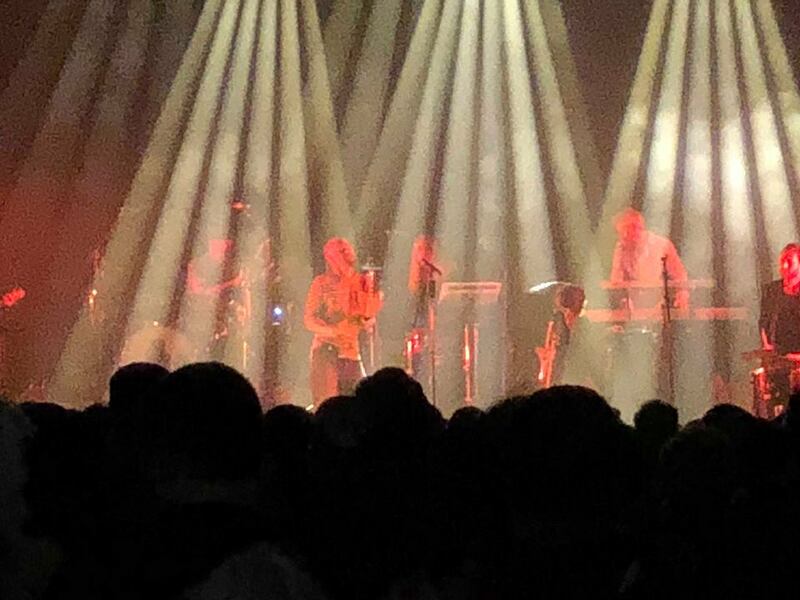 Support came from Lanterns On The Lake, playing the closest they get to a hometown show on this tour. “James asked us to play a bit longer tonight” Hazel tells us half way through Lanterns On The Lake’s set, which is excellent news. With the bars located outside the main hall in Middlesbrough, this means that their audience is slightly smaller than the other nights of the tour, but on the upside it also means that they’re more attentive, and attention is needed to fully appreciate this wonderful band. 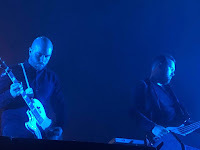 Four of the seven songs they play are from their as-yet-unreleased fourth album that they’re in the process of recording and it promises to be their strongest body of studio work yet. Every Atom is a gorgeous love song that declares “if I have to split every atom just to find a piece of you, that’s what I’ll do”, whilst Before They Excavate, making its full band debut in the set, “the waters are rising, our leaders are unhinged, let’s break out the good stuff and waltz till the end”, full of dramatic intent and evocative images cast through the lyrics. Opener Blue Screen Beams is even more widescreen in its outlook and it’s their sonic ambition and the intensity of their performance that makes Lanterns On The Lake so compelling. That’s no more evident than on the final song Beings, where Angela and Bob are mouthing along to every word Hazel’s singing as it explodes into a glorious cacophony of sound, through which Hazel has to fight to make herself heard. 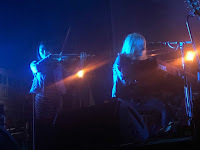 The additional time also allows them to play Faultlines, from their last album Beings, so the audience is treated to two songs tonight with Paul’s unique and visually thrilling guitar playing using a violin bow. At the end of the set, the growing audience’s reaction tells its own story. Lanterns On The Lake might not be the sort of band that blow you away with earworm anthems, but they’re worth every second of time you invest in absorbing them. Their fourth album promises to be something spectacular. The seated venue, unnecessary as the seats have had to be put in especially rather than taken out, makes for a slightly more sedate start to the set than on previous nights. Busted, from the EP, is shuffled forward to open the set, reflecting that slightly awkward moment at shows like this where those itching to stand and dance aren’t sure they can and those that want to sit and take it in haven’t given up trying to get those around them to, pardon the pun, sit down. That stand off continues during Hank, full of drums, everywhere the ear can hear, set off against stunning red and white lights that flash with each drumbeat as Tim delivers his scathing condemnation of the dangerous tool that is the forty-fifth occupant of the Oval Office. The audience standoff is resolved once and for all as the opening bars of Waltzing Along have everyone up on their feet. 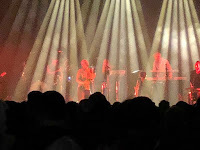 That and Say Something which immediately follows it might be the least complex of the songs they play tonight, but the powerful reaction they generate from front to back and up on the balconies is undeniable testament to their ability to connect with the crowd. On Say Something Tim simply gives up trying to compete with the singalong and holds the mic towards the audience. Any expectations that James’ first gig in Middlesbrough since they came here in 1997 might then end up as a celebration of their past greatest hits is predictably dashed as the band navigate a different course through their back catalogue and give us a fascinating insight into their near future catalogue addition Living In Extraordinary Times. The Shining makes its tour debut and feels euphoric when the chorus kicks in and the band lift the song out of its skin. PS gives Saul opportunity to show off his violin playing as Tim spits the vitriolic kiss off lyrics. Then they go back to the new material. There’s something about these songs that even after only three listens that I seem to know the words to every single one of them, an immediacy to the lyrics that’s slightly in contradiction to the complex percussion around the likes of Heads in particular. There’s a very obvious excitement in the band at what they’ve created, something that sparks the rest of the songs in the set too as they’re forced to up their game to compete. Coming Home Pt 2 is possibly the least challenging sonically of the new songs, but it has the most uplifting chorus of them all, Tim declaring “I wanna hold your hand across the dark” as he laments being away from home and missing out on his son growing up. It’s something that’ll resonate in the same way Moving On has. 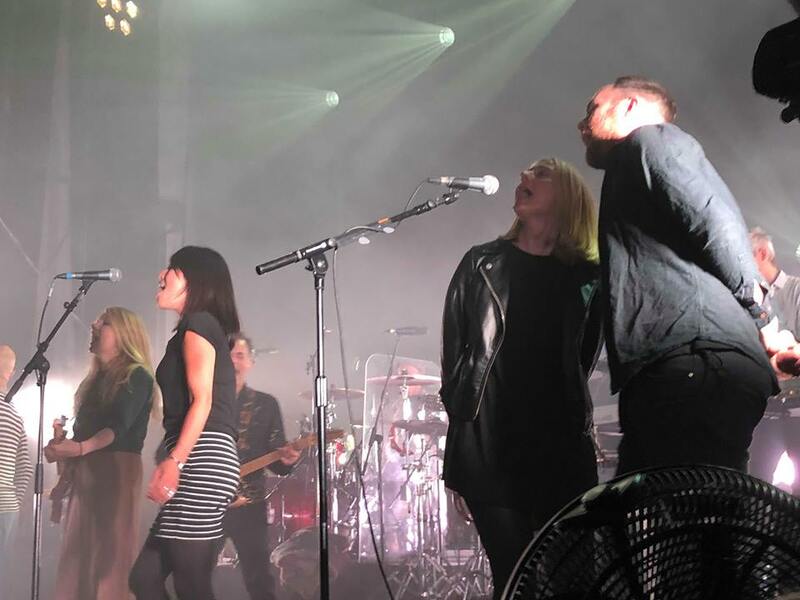 As the song reaches its final chorus, the audience are clapping along, Debbie’s banging drum sticks above her head and Tim’s prowling the stage, creating a magical visual spectacle. James then jump from the oldest to the newest like some kind of Marty McFly. Scarecrow might be one of their earliest songs, dating back to the days when only Tim and Jim of the current line-up were in the band, but you wouldn’t know it from the way it seems to feed off the kinetic energy of the new songs and shed old skins and grow more youthful ones. Tim chides the audience for having filled his stairs down to the audience with drinks and warns jokingly that he doesn’t want to kick their beers into their faces as he gets lost in the moment. He manages to avoid them as he comes out during How Was It For You? It’s time then to debut What’s It All About?, the closing track on Living In Extraordinary Times, and one of those journey songs that have so many different sections you can only identify them as coming from the same place by their dental records. It ends in a gentle acoustic strum with Tim repeating a mantra-like chorus, stood inches away from Adrian. Leviathan is probably my favourite of the new tracks, a song about finding love in an unexpected face, following the path and it opening out into something mystical and magical. almost ad lib it without anyone noticing and in the process create something unique. Many Faces is the penultimate of the new songs and is the one that become the modern day James anthem. The crowd don’t quite take it over the way the Halifax crowd did the other night, but that’s the magic of an audience spontaneously reacting to songs that they’ve never heard before in different ways. Like “sometimes when I look deep in your eyes I swear I can see your soul”, the line “we’re only one human race, many faces, everybody belongs here” can mean anything or everything to people, be specific and generic at the same time. Getting Away With It (All Messed Up) gets an ecstatic reaction, which always surprises us given its release was a bit of a damp squib in the days when Mercury had lost interest and didn’t push the Pleased To Meet You album at all. Nowadays it’s one of the songs whose absence is most lamented when it’s not present, even though it’s never really undergone the surgery some of the old favourites have over time. It just about holds its own against the new kids on the block. Born Of Frustration is preceded by Tim telling us “I know you love me, but I’m coming out with trust” as he goes walkabout as crowd-surfing is impractical and the balconies inaccessible from the stalls without leaving the arena. There’s moments where he stops and sings directly to people, he moves past those that make a desperate grab at him other than when a guy lifts him up and a girl ruins a moment with a guy in a wheelchair by sticking her phone in his face. They finish the main set with Better Than That, Tim laughs “you have a f**king clue about it, have you” although the response tells a different story. Someone throws a wig on stage, narrowly missing him but prompting him to tell us that he’s proud of his bald palate. The way the chorus suddenly lifts the song and explodes into life is something that so much of the back catalogue of hits does and shows that James can still do this whilst they’re experimenting and exploring new avenues of sound at the same time. 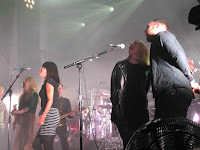 The encore starts with Sometimes and Lanterns On The Lake are invited on stage and Tim ends up in a dance off with Angela whilst the rest of them join in with the massed choir on and off the stage. It proves Tim’s earlier point about Sit Down. Moving On is a telling reminder too that James continue to touch lives, get behind the facades of impregnability that society encourages people to put up these days and talk to people in the rawest and basest emotions. Just looking around you see how this song has talked to many of those around us who’ve lost people in the way it acted as part of Tim’s own healing processes. They finish off with the two-tone Laid, first slow then chaotically fast. The seats prevent a proper moshpit forming, but the crowd manage to improvise around the obstacles in their path. For all the intensity, experimentation and internal and external challenges of the band’s performance, there’s something about this three minute ramshackle song that creates so much joy and love. It’s tempered slightly by someone thinking they can climb on stage and help themselves to drumsticks and Tim’s maracas, but they’re soon put in their place before it escalates too far. The seats meant that there was never going to be quite the same communal coming together there had been in Warrington and Halifax, but the band took the situation in hand to create a different experience for the audience – just enough of the hits to sate those whose entry point and current location is The Best Of and plenty for those who want to hear the magnificent new material revealed to them and discover how that’s influenced their thinking on older songs. James played Busted, Hank, Waltzing Along, Say Something, The Shining, PS, Heads, Coming Home Pt 2, Scarecrow, How Was It For You?, What’s It All About?, Leviathan, She’s A Star, Sit Down, Many Faces, Getting Away With It (All Messed Up), Born Of Frustration, Better Than That, Sometimes, Moving On and Laid. The Better Than That tour takes in the following venues : Oban Corran Halls (23) and Scunthorpe Baths Hall (25).